The true meaning behind HOPE! A sad story regarding our puppy. Everyone has experienced a lapse in judgment when it comes to the heart - my family did it, we own it and if anyone wants to comment with anything negative about our decision just know we are already paying for it so nothing more negative needs to be said... It's done and now those who will or have met HOPE will now understand the true meaning behind her name. Samantha has been asking for a dog for years now. Initially I promised her a dog when she turned ten and then when she turned ten I said after the cats pass away - Samantha's heart broke. So we made an agreement with her that if she cleans the kitty litter, bird cage, Guinea pigs cage, does the dishes proves she can be responsible then we will get her a puppy. Well time went on and Samantha completed her chores never complaining - all she kept saying is she will do anything for a dog. Samantha's friend showed her a website for dogs needing a home - we reached out to a few people and shelters but none had dogs we wanted or were willing to give puppies to two working FT parents. So, we put together a plan and a good friend offered her services while we were at work. So, we went online spoke to one person who said they could fly the dog to MA within a few hours but she wanted money at first !!!!! I think not. We googled her and plenty of articles online about this lady scamming people out of money. So, Wednesday morning I happened to be looking through Craigslist - I tried Massachusetts, New Hampshire and found nothing that warned my heart. 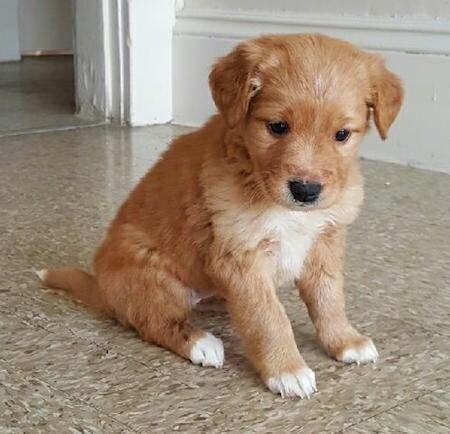 Then I went on Providence Craigslist where there was a picture of two baby Golden Retrievers - I immediately fell in love with HOPE so I called the seller at: 1 (000) 000-0000 - he gave me his texting addresses so we could chat - I called him and he sounded sick - you could tell he had a bad cold. I asked him about the dogs. - he said it was a litter of 8 - he kept one sold the other 6 and he just reposted the ad because the person who was supposed to pick up HOPE backed out. I knew she would be gone quick if I didn't commit to picking her up. Me being impulsive and falling in love with the dogs pic said we would take her - the owner sent me some pics even let me hear the dogs whining over the phone - So, Greg and the guy spoke - I didn't ask details because I figured Greg asked the questions. Also how could we get scammed if Greg saw the dog before giving the money what did we have to lose? So given the guy was sick he suggested meeting Greg in front of the Garden Section of the Chicopee Walmart - he told Greg the name of his car - they met up - Greg fell in love with the dog, handed the guy the money and left. Greg came home and everyone immediately fell in love with HOPE! 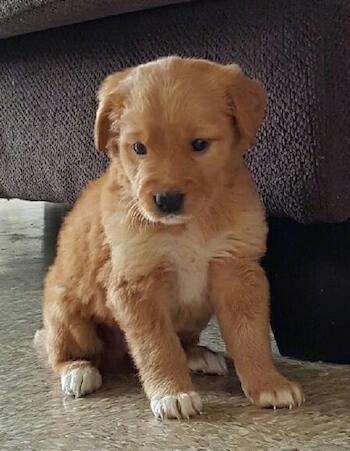 We have her that name because we hoped for a golden retriever for so long and looking at her she seemed perfect!!!! I started texting the guy who sold us HOPE about some questions I had - no response. I started getting a bad feeling. I started googling stolen dogs because at first that's what I wondered since he no longer answered his phone - the Craigslist ad was taken down and I just got a text message voicemail when calling the number. The more I thought about it the more I worried. The more time I spent with HOPE the more I noticed things weren't right - she was walking into things - I said to Greg and Samantha that I felt she was blind - everyone told me I am too negative and paranoid. I question why she doesn't eat and is lethargic - everyone said new dogs are nervousness the first few days in a new environment and that it takes time for them to warm up. But something didn't ad up. We took HOPE to the vet today and got devastating news. The vet asked if I had concerns. I came right out and asked if she is blind. He did some tests and confirmed my suspicions. HOPE was indeed blind. Now I can handle that and wouldn't love her any less but they also tested her/ran some tests for Liver Shunts (Portosystemic Shunts - And the prognosis is high that she has it. More tests have been run and we will know later this week what type of surgery she will need. My heart aches but right now HOPE is the perfect name for her. Unfortunately we took Hope to a second vet - results not good it was suggested to put her down. I couldn't go through with it. My husband was agonizing over it and made the decision to bring Hope to Angells Memorial MSPCA - we surrender our rights to her so she could get care we couldn't afford. We are all real sad about this and yes we take full responsibility for buying a dog off crsigslist from a non breeder. But now I have two little girls with broken hearts - a husband and myself that are distraught so we don't need to hear the lectures as we are paying the price enough. Who could be so cruel to pass this dog off without any warning. Thankfully the person who sold us the dog met us in a public place with video surveillance - I'm working with a detective who will be requesting the surveillance tape - hopefully I can get the guys real name and license plate and expose him publicly for what he did. I don't want anything from this but awareness and for HOPE to live a healthy and happy life. We need all the support we can get. Writing this, admitting my lack of decision making skills was hard enough but others should know what we are going through so they don't find themselves in the same situation. If anyone wants to contribute to her medical bills that would be great otherwise we are not sure we can keep her. As for HOPE she will never be loved any less - she was part of our family and love her even if she is no longer ours. HOPE is the perfect name! 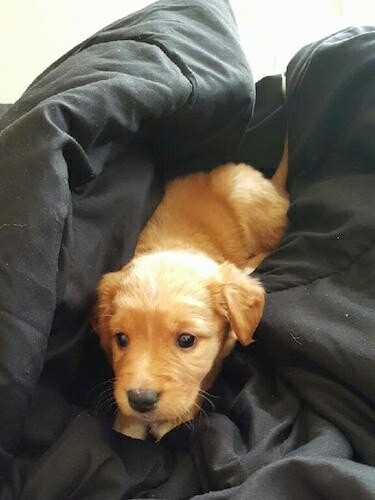 I had been looking for golden retrivers for months and they I found someone selling them online ($400). I contacted the seller through text message where he asked what I was looking for and then he sent me pictures and videos of the dog "Cooper" and he was everything I was looking for, I was ready to pay for him and go pick him up in Scottsdale, AZ only an hour from where I live but when I asked him about pick up he said he had just moved to Texas but he offered to have him shipped to me for only an extra $100 dollars. I talked it over with my boyfriend and he suggested we not make any quick decisions. Meanwhile the breeder was pushing hard for me to get the dog shipped out that same day. After thinking about it I decided it was a decision that took more time than the seller was going to give me so I apologized and explained why we were backing out. Later that day I went looking in my email for the video he sent me of Cooper. As soon as I opened the video I realized what was going on because the video had been stolen from a popular YouTube blogger (over a million subscribers) who has been video documenting the life of his dog "Cooper". Thank you all for the warning. Here's another one: Shipping company: PetsExpress Consultant Maltese "Seller" James Scotte Wilmington, Delaware (000) 000-0000 I want the puppy but I can only make the deal if we stick to the terms you & I agreed to: I pay the $450 C.O.D. and there is no other amount requested. Let me know what you decide on doing. Thanks. His response (in summary): I'm a Christian. I paid the shipping company $150 to send you the puppy. My son is sick but I still did this favor for you because I trusted you. Now what am I going to do? This is why I'm so scared of people because they take advantage of me. Etc. etc. etc.